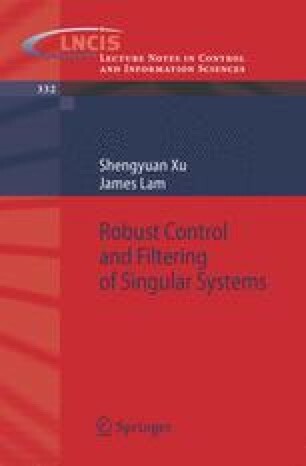 This chapter is devoted to the study of the stability for singular systems in both the continuous and discrete contexts. The definitions of regularity and non-impulsiveness (in the continuous case) or causality (in the discrete case) have played important roles in the analysis of singular systems. Specifically, regularity guarantees the existence and uniqueness of a solution to a given singular system, while non-impulsiveness ensures no infinite dynamical modes in a singular system. It is worth mentioning that a singular system usually has three kinds of modes; that is, finite dynamic modes, infinite dynamic modes and infinite nondynamic modes. Infinite dynamic modes can generate undesired impulsive behavior. In the state-space case, neither infinite dynamic modes nor infinite nondynamic can arise. In addition, regularity and non-impulsiveness are satisfied automatically in the state-space systems. Therefore, for a singular system, it is important to develop conditions which guarantee that the given singular system is not only stable but also regular and impulse-free (in the continuous case) or causal (in the discrete case). In the literature, it is reported that such conditions can usually be obtained by decomposing singular systems into slow and fast sub-systems . However, this may lead to some numerical problems. Furthermore, from the mathematical point of view, the decomposition approach is not elegant. Thus, attention in this chapter will be focused on the derivation of such conditions without decomposing the original singular system, and a linear matrix inequality (LMI) approach will be developed.